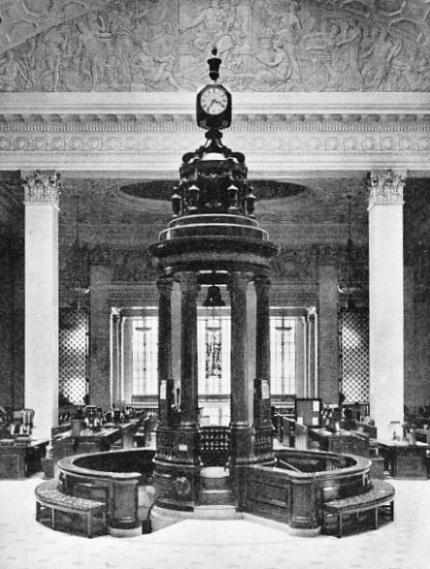 THE UNDERWRITING ROOM at Lloyd’s, with the Rostrum in the centre. Underwriters are so called because their names are written underneath each policy, with a note of the amount for which each underwriter is responsible. In the “Room” the Members have their desks for transacting business. To become a Member of Lloyd’s a candidate must be British-born and his antecedents, social status and financial position have to satisfy close scrutiny. Once elected, the Member becomes personally liable for all the risks that he undertakes. “TOUCHING the Adventures and Perils which we the Assurers are contented to bear and do take upon us in this Voyage” - so runs a clause in Lloyd’s standard marine insurance policy. It is believed that before the seventeenth century a large amount of marine insurance was effected by Hanseatic Leaguers (members of German business associations) who had established themselves in London. Later, the business in London was carried on chiefly by the Lombards, who gave their name to Lombard Street. About 1688, however, one Edward Lloyd, a coffee-house keeper in Tower Street, made it his business to cater for sailors and merchants. He collected items of news relating to the sea and read them aloud to his customers while they consumed their refreshments. In 1692 Lloyd removed his business to the corner of Abchurch Lane and Lombard Street and in 1696 had a newspaper printed three times weekly, called Lloyd’s News. This paper offended the Government of the day and it was suppressed. In 1734 Lloyd’s List appeared, and in 1836 the rival Shipping Gazette. The two papers, after long association, were amalgamated in 1916, as Lloyd’s List and Shipping Gazette. This newspaper has thus had a continuous existence since 1734. In 1770 the underwriters and brokers who regularly frequented the coffee-house formed themselves into a regular association, with the title of “Lloyd’s” and met in Pope’s Head Alley. By 1779 a standard form of marine insurance policy had been adopted, and it has survived, little altered, to the present day. 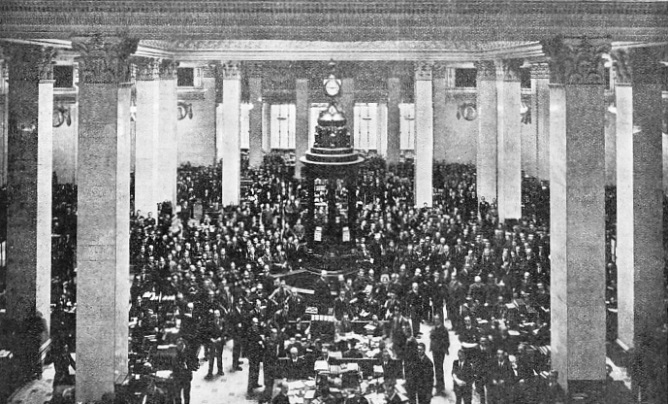 The “coffee-house” status had been completely outgrown by 1774, when the association was removed to the Royal Exchange - its headquarters until 1928. The move was initiated by John Julius Angerstein (1735 - 1823), the Russo-British business man and amateur of art who had begun as an underwriter at Lloyd’s in 1756. He is perhaps better known as the owner of a picture collection that became the nucleus of the National Gallery. Angerstein, having met with some opposition, made himself responsible for the rent of rooms in the Royal Exchange and carried his point. In 1838 a fire destroyed the Exchange and most of the records of Lloyd’s, and in 1844 a new tenancy of a large part of the new Royal Exchange was entered upon. IN THE “CASUALTY BOOK” and on the “Casualty Boards” - both in the Underwriting Room at Lloyd’s - is to be found the latest news of wrecks and marine disasters. When there is a total loss the owner gives “Notice of Abandonment” to the underwriters and then claims for payment in full of the amount insured. The “Casualty Book” and the “Arrival Book ” are placed on either side of the Rostrum. Before 1871 Lloyd’s was merely an association of underwriters and brokers, but in that year it was incorporated by an Act of Parliament, and statutory duties were subsequently laid upon it. In 1923 the Committee bought the site of the old East India House in Leadenhall Street, and a magnificent new building was erected there. On March 24, 1928, King George V, accompanied by Queen Mary, formally declared the building open. Lloyd’s consists of a number of individuals, working singly or in groups, concerned with insurance in all its branches, but it is only with the marine side that this chapter can legitimately deal. It is on marine business that the organization’s world-wide fame has been built up. Underwriters are so called because their names are written underneath each policy, with a note of the amount for which each underwriter is responsible. Brokers act as the negotiating medium between the public and the underwriters. A Committee governs the whole and lays down regulations for safeguarding the interests both of the Members of Lloyd’s and of the public. The Members are required to comply strictly with these regulations. It is no easy matter to become a Member of Lloyd’s. The antecedents, social status and financial position of each candidate, who must be British-born, are closely investigated. Once elected, the Member becomes personally liable for all the risks that he undertakes and he has to deposit securities as guarantees with Lloyd’s. The main apartment of the new building is known as “the Room”. Here the Members have their desks for transacting business. In the centre is the Rostrum and within it is suspended the Lutine bell. The Lutine was a French 32-guns frigate. She was captured by the British and incorporated in the Royal Navy. On October 7, 1799, she left Great Yarmouth (Norfolk) with a cargo of specie valued at £1,175,000, and the same night she was wrecked off the island of Vlieland, in Holland. Numerous attempts have been made to salve the treasure, and among the objects which have been brought up is the famous bell. 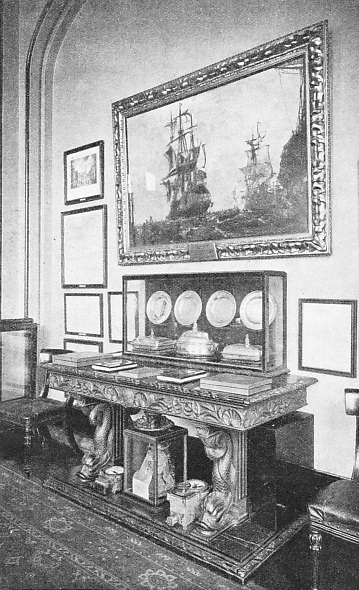 This was presented to Lloyd’s, with some of the vessel’s timber, from which a chair and table were made. The Lutine bell plays a significant part in the daily life of Lloyd’s. One stroke calls for silence for any announcement from the Committee. Two strokes indicate that news has been received of an overdue ship. 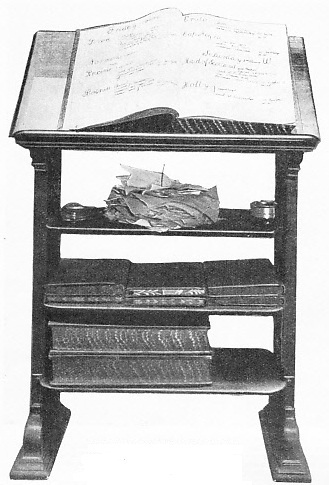 On either side of the Rostrum are the “Casualty Book” and the “Arrival Book”. In another part of “the Room” are the “Casualty Boards”, on which is to be found the latest news of wrecks and marine disasters, as well as information about aircraft and fires. Formerly “Criers” were employed to call out the names of Members who were wanted. The “Criers” were dressed in red robes and had loud voices and strong lungs. Walter Farrant was one of the most famous of the “Criers”. In these days of microphones and amplifiers loud voices are not so much in demand. The attendants are still called waiters and are dressed as formerly in red. SALVED FROM A WRECK, one of ten boxes of Spanish gold coins, with a total value of £100,000. In 1885 a Spanish mail steamer, carrying the boxes of gold, sank off the island of Grand Canary, Canary Islands. 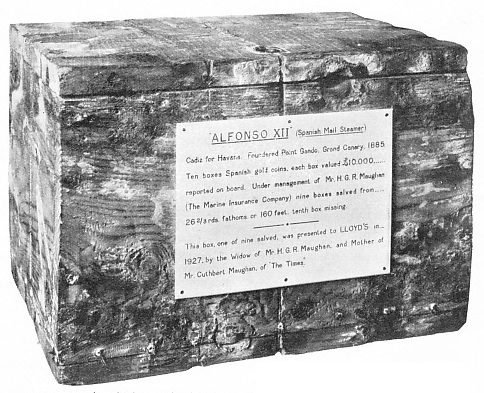 Nine boxes were salved and one of these, illustrated here, is among the interesting relics kept at Lloyd’s. The “Captain’s Room” was originally an apartment set aside for the use of ship captains who brought shipping information. To-day the name disguises an elaborate restaurant, smoking room and lounge. Insurances of ships and cargoes are effected through brokers, who receive their remuneration in the form of a percentage on the amount of the premiums paid. The broker writes a “ slip ” containing particulars of the business to be entered into, such as the description of the subject to be covered (“hull” or “cargo”), the period of time cover is required and the particular risks to be insured against. Armed with the necessary particulars on his “slip”, the broker approaches the underwriters, secures an initial for the amount for which each underwriter will be responsible and arranges the premium to be paid. Underwriters generally act for syndicates of “names”, each “ name” generally taking a “line” of £100. The risks on a large sum are thus split up over a number of individuals, obviating a heavy liability on one risk. The broker then informs the insurers and issues a “cover note” to hold the subject matter insured until the formal policy is issued. Lloyd’s standard insurance policy is supplemented and even overridden by additional clauses, drawn up in standard forms to cover particular circumstances. These standard forms are called Institute Clauses. For example, there are Institute Cargo Clauses, which provide for the insurance of cargo in ordinary conditions and special clauses again for frozen meat, rubber, flour, and so forth. For insurance on hulls there are the Institute Time Clauses, under which steamers or motor-ships are insured for twelve months on all-risk conditions. There are also special clauses for builders’ risks, port risks, hulls on the Great Lakes and yachts. Reference is made in the clauses to “York - Antwerp Rules”. These rules, first agreed in 1890, were revised in 1924 at Stockholm and provide an international arrangement for the settlement and adjustment of General Average claims. SUSPENDED IN THE ROSTRUM, in the Underwriting Room, is the famous Lutine bell. The Lutine was a captured French 32-guns frigate incorporated in the Royal Navy. On, October 7, 1799, having left Great Yarmouth (Norfolk) with a cargo of specie valued at £1,175,000, she was wrecked off the island of Vlieland, in Holland. Among the objects salved was the ship’s bell. The Lutine bell plays a significant part in the daily life of Lloyd’s. One stroke calls for silence for any announcement from the Committee. Two strokes indicate that news has been received of an overdue ship. Average is defined as “material damage or pecuniary loss sustained in the course of a marine adventure”, and is divided into two classes - Particular and General. Particular Average is the term used for loss arising from damage to a ship or cargo by stress of weather, fire, collision, stranding and similar accidents. Losses arising from these causes lie where they fall, and must be borne by the covering underwriters. The standard policy provides that in certain instances no claim shall be made for Particular Average unless it amounts to three per cent of the declared value. The method by which a Particular Average claim is adjusted is to arrive at the difference between the amount realized for goods in a damaged condition and the sum that they would have been worth if they had arrived undamaged at their destination. The percentage thus determined is applied to the amount insured by the policy. General Average arises in the following way. A ship may be in danger of damage or destruction. To save the vessel, the master thinks it necessary to throw overboard portions of the cargo or to cut away some of the ship’s gear. He is successful in bringing- his craft into port with part of her cargo undamaged. It is only fair that the owners of the uninjured cargo should contribute towards the losses caused by the throwing overboard of goods or by the sacrifice of gear, as this was done for the common good. STATUTORY MARKS carried by a vessel - the “Plimsoll mark” and the “gridiron”. The “Plimsoll mark”, named after its originator, Samuel Plimsoll (1824-98) consists of a circle with a line drawn through it. The five horizontal lines on the “gridiron” indicate the depth to which a ship may be loaded in varying conditions. The letters “FW” mean Fresh Water, “IS” Indian Summer, “S” Summer, “W” Winter and “WNA” Winter North Atlantic. We may take another example: A ship’s engines break down and she is in danger of drifting on to rocks. A tug arrives and offers assistance in towing the vessel to safety. The master accepts, and ship and cargo are brought safely into port. The tug’s remuneration for her services will be, not the time and material she expends, but a proportion of the value of ship and cargo. As the owners of the ship and of the cargo have severally benefited, the reward payable to the tug owners will be apportioned between them all. Questions arising out of emergencies of this nature were formerly decided by the Admiralty Courts, but under Lloyd’s Salvage Agreement they are now mostly decided by arbitration. Instances arise in which both Particular and General Average occur in the same casualty. Thus, a ship may go ashore and sustain injury. This would be Particular Average. To get her afloat again it may be necessary to take part of her cargo out into lighters and then put it back again when the ship has been refloated. The expense of handling the cargo in this manner would be General Average. A final instance of General Average is when a ship has been on fire and steam and water have been used to extinguish the blaze. The damage done by the necessary use of the water and steam comes under the heading of General Average. IN THE COMMITTEE ROOM at Lloyd’s. The oil painting illustrates the ill-fated frigate Lutine. Below, in the glass case, is some of the plate formerly belonging to Lord Nelson. The Committee of Lloyd’s is the governing body and lays down regulations for safeguarding the interests both of the Members of Lloyd’s and of the public. Total loss occurs where a ship is hopelessly lost, as when she founders in water too deep to permit salvage operations, goes ashore on a rocky coast and is pounded to pieces, or disappears entirely. Where there is a total loss the owner gives “Notice of Abandonment” to the underwriters and then claims for payment in full of the sum insured. The underwriters are then at liberty to take whatever steps they think may be effective to salve any part of the ship or cargo, even to the extent of collecting any goods that may be washed ashore. Any sum realized from the sale of such goods would be the property of the underwriters. The difficult and complicated work of apportioning average claims is undertaken by “Average Adjusters”. To obviate delay in releasing goods which are the subject of General Average, the owners of the cargo pay the deposit required and receive in return a receipt on which underwriters pay at once. Some other institutions of Lloyd’s deserve attention in this chapter. A “Captain’s Register” is kept, recording the services of every master mariner. The contents of the register are confidential. Its information was much sought after in the days of sailing ships. These vessels disappeared for months together, and the masters, unable to communicate rapidly with their owners, as can be done to-day, were thrown on their own resources in time of trouble. The Salvage Association was founded in 1856 in co-operation with the insurance companies, and deals with salvage operations and with the handling and disposal of damaged ships and goods. The Patriotic Fund, inaugurated in 1803. is supported not only by Lloyd’s, but also by bankers, merchants and various City institutions. Originally the fund was used to reward acts of conspicuous bravery. To-day its resources largely benefit the dependants of those who fought in campaigns before the war of 1914-18. Numerous papers and periodicals are published by Lloyd’s. Lloyd’s List and Shipping Gazette, already referred to, gives the movements of some 11,000 ships, as well as ordinary shipping and marine engine news. Other publications include The Daily Index, Weekly Casualty Reports, Loading List, Law Reports, Confidential Index, Reports of Prize Cases and Lloyd’s Calendar, containing a wealth of shipping information. The information that flows continually into Lloyd’s is derived principally from the 1,300 or so agents and sub-agents scattered all over the world, in almost every port and in the more important places inland. Much information is also derived through signal and wireless stations. FOR SAVING LIFE AT SEA. This medal, instituted as long ago as 1836, is presented by the Corporation of Lloyd’s “as an honorary acknowledgment to those who have by extraordinary exertions contributed to the saving of life at sea”. There are three classes - gold, silver and bronze. The colours of the ribbon are blue, white, red, white, blue. An agent’s business is to assist and advise shipmasters in trouble, to protect the interests of the underwriters where there is loss or damage to ships and goods insured by them, and to keep Lloyd’s posted with all the shipping information he can obtain. An agent cannot give orders to the captain of a ship. No one can take away the master’s authority; but the advice and local knowledge of an agent are sought and accepted in time of trouble. Lloyd’s control signal stations throughout the world and have working arrangements with many others owned by Governments. Through these stations ships can report themselves to their owners and receive orders. Wireless has robbed visual signalling of much of its importance and, as already mentioned, Lloyd’s have arrangements by which ship movements communicated through wireless stations are passed to them. In 1836 Lloyd’s instituted a medal for saving life at sea. It has three classes, gold, silver and bronze. In 1893 another medal was issued, rewarding meritorious services by ships’ officers and by others. This has two classes, silver and bronze. The medal illustrated here was awarded in 1913. FOR MERITORIOUS SERVICES. 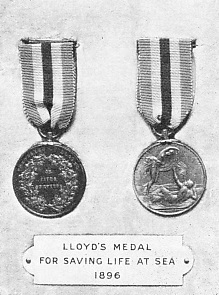 In 1893 the Committee of Lloyd’s instituted a medal rewarding meritorious services by ship’s officers and others contributing to the preservation of vessels and cargoes when in danger. There are two classes - silver and bronze. The ribbon colours are blue and silver. 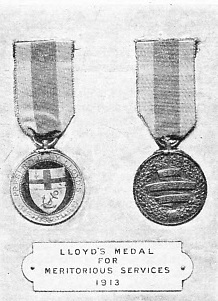 A third medal was issued in 1913, in gold, silver and bronze, rewarding particular services to Lloyd’s. The chief recipients of the gold medal have been Chairmen of Lloyd’s. Lloyd’s come to the rescue of a shipmaster who has run short of funds in a foreign port, and who for some reason, cannot get into communication with his owners. A standard form of “Bottomry Bond” has been issued, whereby, in return for a loan, to enable necessary repairs to be executed or stores bought, the master “pledges” his ship for repayment. Lloyd’s “Respondentia Bond” is provided in the event of a ship becoming damaged and unable to complete her voyage. Her master decides to transfer the cargo to another vessel and borrows funds on this bond to enable the transfer to be effected. Because of the ease of communication nowadays these two forms of bond are rarely used, as it is expressly provided in both of them that the master has attempted to communicate with his owners for the purpose of obtaining funds, and has failed to do so. Lloyd’s Register of Shipping is a body distinct from Lloyd’s. Lloyd’s Register is a book containing information about the construction of every ship of any importance. Published by Lloyd’s Register of Shipping, it was first issued in 1834, when the society was formed by the amalgamation of two rival registers. To-day Lloyd’s Register comprises two, or in some issues three, volumes. The larger volume, which may be subdivided, contains particulars of every existing sea and Great Lakes ship of 100 tons and over. River vessels are often included. The smaller volume, or Appendix, contains lists of shipbuilders and marine insurance companies, details of dry and wet docks, harbours, quays, slipways and so forth, statistical tables, and much other information. Lloyd’s Register of Yachts, a separate publication, was first issued in 1878. IN THE EIGHTEENTH CENTURY auction sales were held at New Lloyd’s Coffee House. 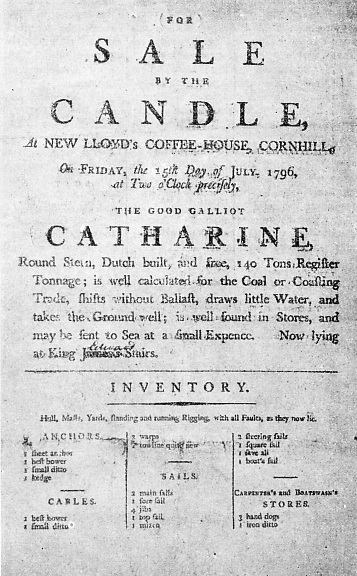 The poster reproduced above gives notice of the sale of a vessel “by the candle”. When this method was adopted, the lighting of a candle opened the auction. Bids were accepted as long as the candle was alight. The last bidder before its extinction was declared the buyer. A galliot, such as the Catharine described here, was a one- or two-masted Dutch or Flemish type merchant vessel. The oldest steamer on the 1935-36 Register is the Hsin Tai, a screw steamer of 481 tons gross, built of iron in 1840 by the Nevsky Shipbuilding and Mechanical Works of St. Petersburg (now Leningrad). She is registered at Tientsin under the Chinese flag. The duties of the Committee of the Register include the survey and classification of ships, the production of the Register Book, annually in July, the testing of chains and anchors, the testing of steel intended for ship construction, the “assignment of freeboard” - or the determination of the spot where the load-lines of a ship shall be marked, and the survey of refrigerating machinery. The expression “A1 at Lloyd’s” is well known as an indication that everything is of first-class character. Technically, it refers to a wooden ship that complies fully with the requirements of a Lloyd’s survey. Originally ships were classified as “A”, “E”, “I”, “0” or “U”, with reference to the degree of excellence of the hulls, and as “G”, “M” or “B” (meaning “good”, “middling” or “bad”) with reference to their equipment. Thus “A.G.” meant a first-class ship in every way, and “U.B.” the reverse. Later the figures 1, 2, 3 and 4 were applied to the equipment - hence the expression “A1”. A ship that fell below the required standard was said to be “off her letter”. A letter, without a number, as “A”, denoted a ship from whose equipment something was missing. +100 A1 - referring to a ship built in accordance with Lloyd’s rules. +100 A1 “With Freeboard” - meaning a ship built with less than the minimum draught allowed by the rules. +100 A1 “Special Service” - referring to ships built for particular purposes, such as trawlers or tankers. +A1 “Special Service” - applied to certain classes of ships intended for such work as “River Service”, “Coasting Service” and so forth. To maintain her classification a ship must undergo an examination at regular intervals by a Lloyd’s surveyor. If a ship or her equipment is not maintained by classification her insurance rates go up. Lloyd’s surveyors have been appointed at some 170 places - principally seaports - throughout the world. They have to survey and determine the classification of ships and engines for the purpose of the Register. It is also their business, when requested by an agent, owner or master, to assess the amount of damage caused to ships and to report accordingly. They advise as to the steps that should be taken to assist a damaged or distressed ship, or recommend repairs. Agents may call upon any competent person to make a survey, if no officially appointed surveyor is available. It is easy to appreciate the great assistance given to underwriters by the information contained in the Register in determining the condition of a ship and the rate of premium that should be charged for her insurance. U nder the Merchant Shipping Acts it is compulsory for all ships, certain classes excepted, to be marked with load-lines. The Committee of Lloyd’s Register is the Authority empowered by the Acts to determine where these lines shall be placed. The excepted classes include fishing craft, wooden ships under 80 tons (such as Thames barges), pleasure yachts, tugs, dredgers, pilot vessels, passenger ships plying in smooth waters and other non-cargo carrying classes. An illustration of the marks that a vessel must carry is given above. They are a “Plimsoll mark”, a circle with a line drawn through it, and a “gridiron”, consisting of five horizontal lines showing the depth to which a ship may be loaded in different conditions. The “Plimsoll mark” is named after Samuel Plimsoll (1824-98), its originator. Plimsoll’s exertions as a Member of Parliament to lessen the danger to life of overladen and un-seaworthy ships led to the passing of the Merchant Shipping Act of 1876. Of the other registration bodies in existence, the most important are the British Corporation for the Survey and Registry of Shipping and Aircraft, with head offices at Glasgow and surveyors and agents all over the world, the Bureau Veritas, with headquarters in Paris, Det Norske Veritas in Oslo, the Germanischer Lloyd in Berlin, the American Bureau of Shipping in New York, the Registro Italiano at Genoa and the Imperial Japanese Marine Corporation in Tokio. The last two are associated with the British Corporation. 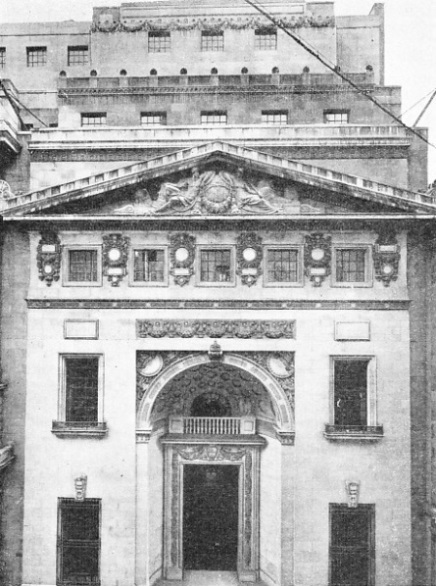 THE LEADENHALL STREET ENTRANCE of Lloyd’s. In 1923 the Committee of Lloyd’s bought the site of the old East India House in Leadenhail Street. The magnificent building erected on this site was opened on March 24, 1928, by King George V, accompanied by Queen Mary. The foundation stone had been laid by King George V in 1925. You can read more on “Dramas of Salvage”, “Marine Measurements” and “Medals for Acts of Bravery” on this website.